Pathogens of sleractinian corals have always been an essential tool to control dominating genera; thus, allowing less frequently occuring species to establish themselves in disease strucken areas. Diseases of reef building corals have increased significantly over the last decade and are causing widespread mortality. Studies have shown that coral diseases are affecting greater numbers of coral species, are increasing in frequency and distribution, and are spreading faster to new regions than ever recorded in the past. In recent years, there has been an emergence of newly described coral diseases with new types of pathologies or tissue conditions not observed in the past. Several of these diseases also have been recorded as killing coral tissue. Coral diseases occur in response to biotic and abiotic stresses. Biotic stresses are instigated by microorganisms including bacteria, fungi, viruses, and protozoans. Abiotic stresses occur in response to physical or chemical stresses, such as increased sea surface temperatures and UV radiation, anthropogenic input of nutrients, sediment, and other pollutants. Abiotic stresses may exacerbate the role of microorganisms in disease processes. Thus, the recent emergence of disease in corals is believed to be a consequence of deteriorating water quality that favors the proliferation of microorganisms, or of a reduced ability of a coral to defend itself against biotic and abiotic stresses. Many kinds of solitary corals or small coral colonies of anthozoans (phylum cnidaria) grow in temperate waters along marine shores, and even in the cold deep waters of the Arctic. However, the great majority of corals are scleractinian (stony) corals that construct tropical coral reefs (hermatypic - fig.1). Substantial reefs develop only in clear (excellent visibility), unpolluted (very little organic matter, or sediment), warm shallow or subtropical waters on firm substrates. They flourish best where the annual average temperature must not go below 18�C and the optimum temperature is 23�C to 26�C. 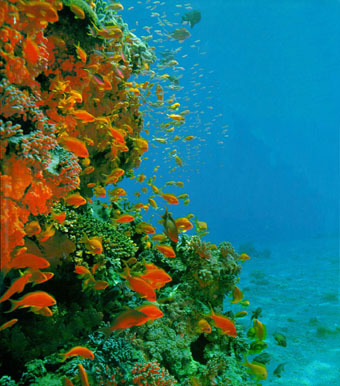 Although, reefs in the Arabian (Persian) Gulf can survive enormous fluctuations in temperature from as low as 17�C in cold winter to up to 32�C in the summer. 1.b Corals are of two types: perforate and imperforate. Perforate corals have porous skeletons with connections between the polyps through the skeleton. Imperforate corals have solid skeletons. Corals also have different growth forms. They can be placoid as in Tubastrea coccinea (orange cup coral) and Favia fragum (golf ball coral). They can also be meandroid in which corallites form a series within the same walls, as in the species Dendrogyra cylindrus (pillar coral). Other growth forms include coccoid, spherical shaped and phalecoid, as in Eusmilia fastigiata. Coral Anatomy: Coral reefs are the most luxuriant and complex of all benthic communities. Scleractinian corals are usually colonial animals connected together by means of lateral folds of the body wall. Individual animals are called polyps (fig.2); a polyp is very similar to a tiny sea anemone with its stinging tentacles, but unlike the anemone, a coral polyp extracts CaCO3 from the water and builds within its tissues a calcareous skeletal cup. 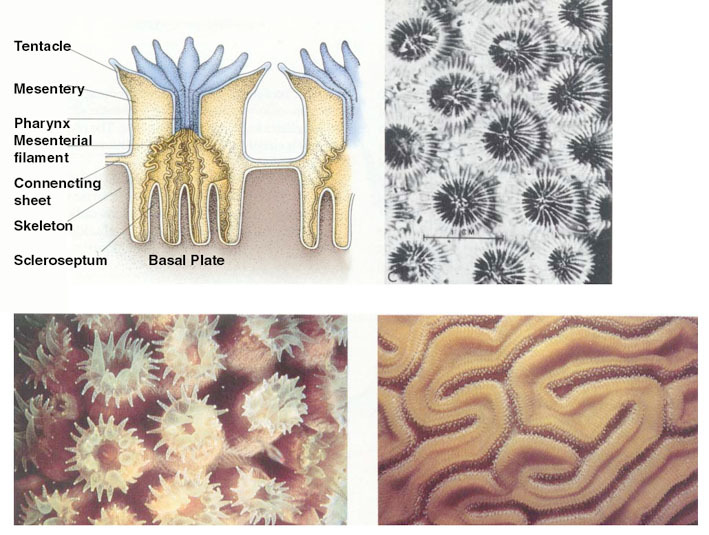 The structure of the polyps and the skeleton of the coral is rather a simple combination (fig.3) A polyp is made up of two cell layers: the epidermis and the gastrodermis. The non-tissue layer between the gastrodermis and the epidermis is called the mesogloea. 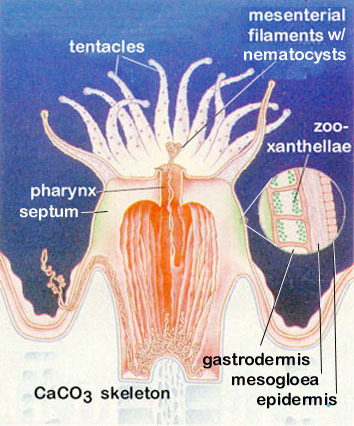 The polyp contains mesentery filaments, which contain nematocysts used in food capture, a pharynx, endothecal dissepiments (horizontal layers of skeletal material) and the columella (the central axis of the corallite found below the mouth). The corallite is the part of the skeleton deposited by one polyp. The skeletal wall around each polyp is called the theca. Other structures include the calice (the upper opening of the corallite), the coenosarc (the coral tissue that stretches over the surface of the coral between the polyps), the coenosteum (the skeletal material around the corallites), and the corallum, which is the skeleton of the coral. Septa, calcareous plate-like structures, radiate from the wall to the center of the corallite. There are two types of septa: insert septa which lie below the corallite wall and exert septa which protrude above the corallite wall. (for a more detailed insight on coral anatomy, try this link). Algal Symbiosis: The algal symbiont in most marine cnidarians is the dinoflagellate Symbiodinium microadriaticum (zooxanthellae - fig.4). A vacuole of the gastrodermal cells (lining of the gut) can host about 50 dinoflagellates (coral tissue may contain as many as 30�103 symbiotic dinos per mm3). As a symbiont, the dinoflagellate lacks flagella and has a reduced cell wall. The yellow-brown color of the dinoflagellate (accessory pigment like peridinin, a.o.) is imparted to the host in the egg, larval stadium or via engulfment as an adult of free algal cells. Since dinoflagellates require light for photosynthesis, their host must live in shallow clear waters less than 75m deep. Excess products of photosynthesis (as much as 50%) are translocated to host as glycerol, glucose and alanine. In return, the algae utilizes the host's nitrogenous wastes and acetate. In reef-building corals, extraordinarily high rates of calcification is achieved through the utilization of abundant sea water HCO3- and zooxanthellae to remove CO2 (approx. 9kg of CaCO3� m-2 � year-1). In the absence of zooxanthellae, the secretion of CaCO3 by scleractinian corals is greatly reduced (for a more detailed insight on symbiontic associations, try this link). Maladies are all stress related. Stress is considered to be a significant deviation from conditions optimal for life, which elicitate changes and responses at all functional levels of the organism; these changes may be reversible. But if stress persists longer or is very intense, these changes can be permanent. Thus, reduce the allover resistance (fig.5). The dynamic response of the whole organism to external influences can lead to distress (comprising a destabilizing effect upon the organism), or eustress (promoting a stabilizing and resisting effect upon the organism). 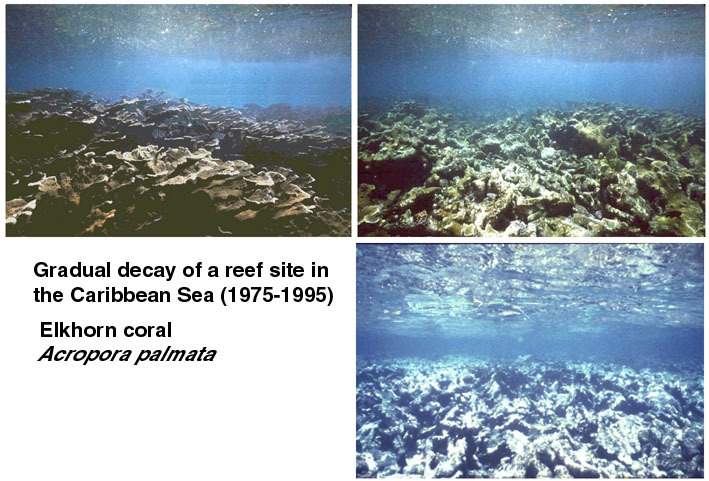 Unfortunately, the current state of many coral reef's seem to have passed the resistance phase and is probably already entering the final state of exhaustion (fig.6). Stress that increase a coral�s susceptibility to diseases can have natural causes (e.g. inter-/intraspecific competition, predation etc.) but most certainly is related to anthropogenic influences. .... please continue with section "Diseases acting without pathogens"